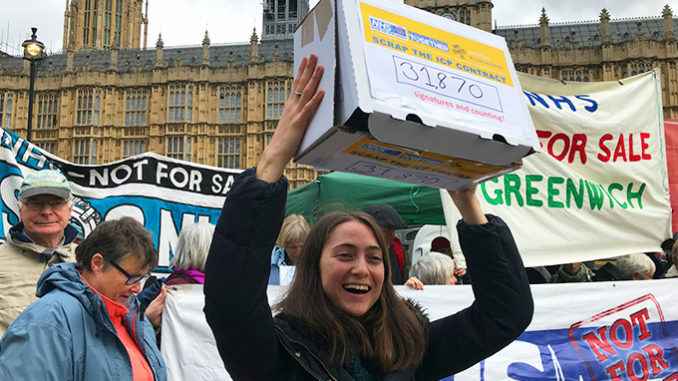 Today 100 NHS and anti-privatisation activists gathered in Westminster to demand that NHS England rule to scrap the proposed Integrated Care Provider contracts. 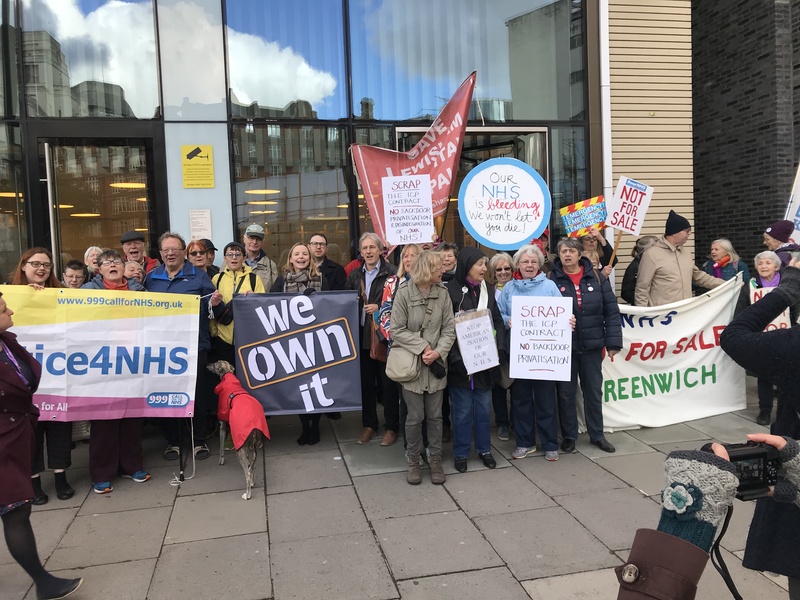 Keep Our NHS Public were joined by campaigners from Health Campaigns Together, We Own it, Justice4NHS, JR4NHS/999, and several local campaigns including Lewisham, Lambeth, Charing Cross, Greenwich, Southampton, Hackney and many more. 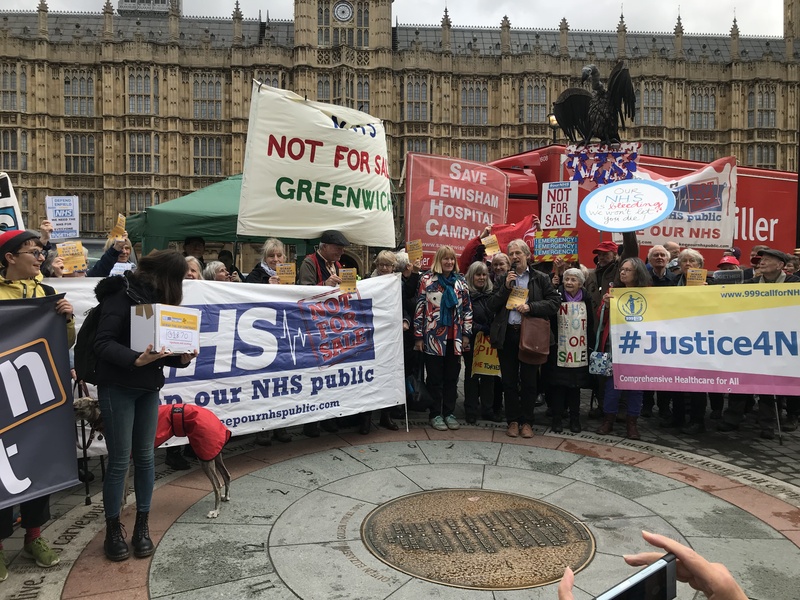 The rally was called to highlight opposition from NHS activists and others to ICPs and to support for the National Health Service Bill, whose Second Reading was scheduled today – though no debate time was possible. These ICP contracts will be open to the private sector to compete for and are a serious threat to the NHS as a publicly owned and publicly run service. The Government is already overseeing a ‘privatisation by stealth’ agenda and this new re-structuring plan is the next stage in its plan to dismantle and disintegrate our NHS. You can read more about these restructuring plans here. 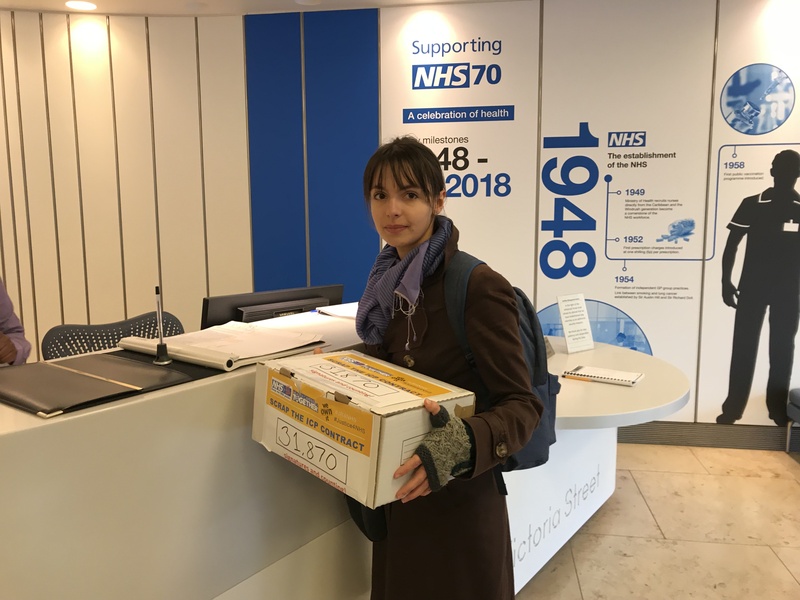 KONP, HCT and We Own It launched a petition last month demanding ICPs be scrapped and by the hand-in today at the Department of Health and Social Care, we had more than 32,000 signatures. Also on the agenda today was to show our continuing support for the NHS Bill which was timetabled for its Second Reading in Parliament today. You can read more about that campaign here. 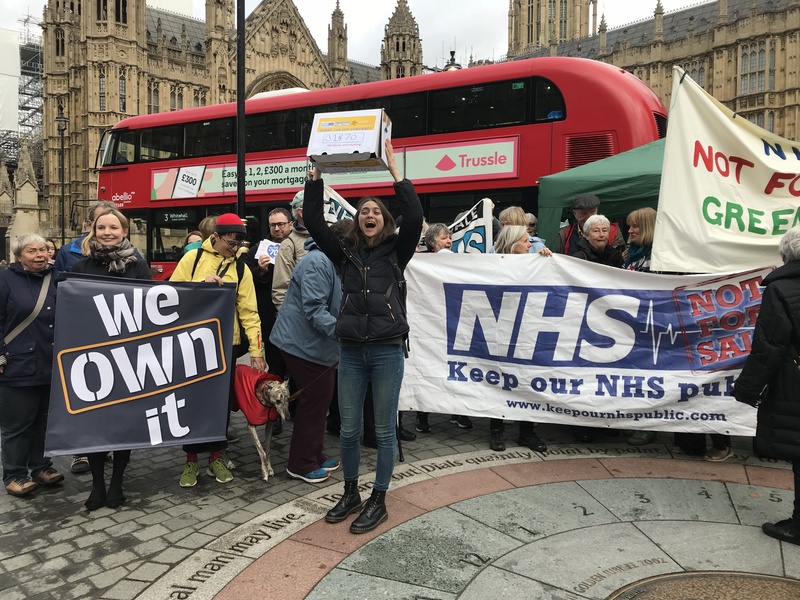 KONP and HCT have really enjoyed working alongside We Own It, Health Campaigns together, JR4NHS and Justice4NHS in organising the petition which we delivered to the Department of Health today and the preceding rally outside parliament in support of the NHS Bill. 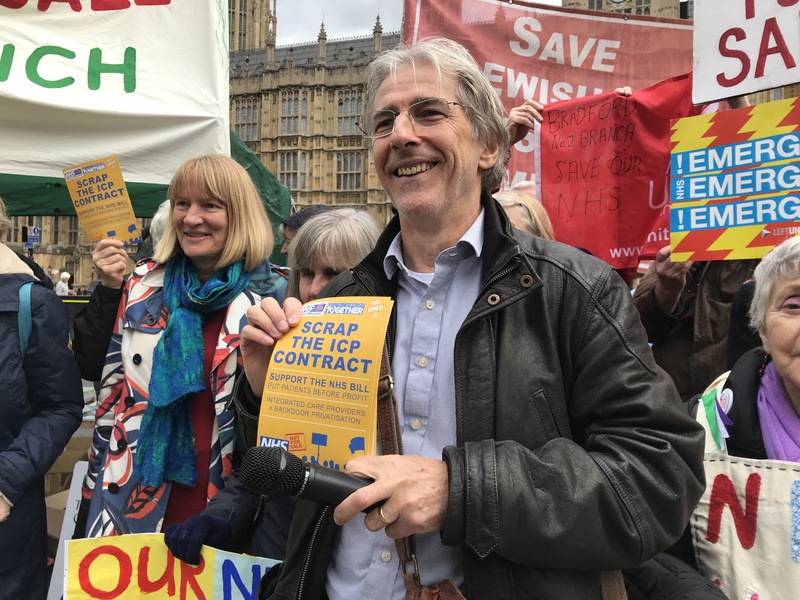 Over 32,000 people signed our petition to scrap the contract in just one month showing what an opposition there is to this. Dr Tony O’Sullivan Keep Our NHS Public Co-Chair today at the Houses of Parliament with Scrap ICPs flyer. I’d like to thank all you NHS campaigners for your support for the NHS re-instatement bill, it’s because of you’re hard work we now have the leadership of the Labour Party behind the bill… Go out into your communities, it’s you that can save the NHS. We want an NHS that works, that is publicly funded, publicly owned, publicly provided and we want social care that is the same. Protesters gather outside the Department of Health to support handing in the petition. The day was a great success and is the perfect platform to build the campaign against these destructive contracts. 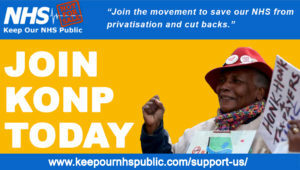 You can watch video from the day, including the full speeches from Eleanor Smith MP and Larry Sanders, on the Keep Our NHS Public Facebook page. Stay tuned by making sure you sign up to the Mailing List. ICP’s are not the way forward to look after our aging population. Systems that are not accountable to the public are not safe, and are far more likely to problematic. ICP’s will continue doing what they are contacted for with no flexibility or conscious because they can.